Thundershirt gentle pressure wrap helps nervous post-amputation surgery dogs. Common post-amputation behavior can often include whining and panting as a side-effect from pain drugs. Loud noises and thunder can exacerbate behavior. While we naturally want to coddle and hug them to calm them down, doing so can reinforce that behavior. Anxiety research experts say that babying sends them the message that something scary is definitely happening. If we can’t reassure them with hugs, what’s a pawrent to do? We’ve talked about natural stress relief treatment options before, like Bach’s Flower Essence Rescue Remedy. You can also try a neat new product we discovered, the Thundershirt. Thundershirts are based on the Tellingtouch Therapy process, which is gentle pressure massage that calms nervous animals ranging from horses to dogs, and even children. Thundershirts provide the same kind of gentle, constant pressure that T-Touch does, and has a dramatic calming effect on most dogs if they are anxious, fearful or over-excited. Thundershirts are like giving your dog a big hug, with the right kind of therapeutic pressure that can keep them calm. There is no training needed; after gently introducing your dog to the Thundershirt, just place the wrap on your dog and observe the results. 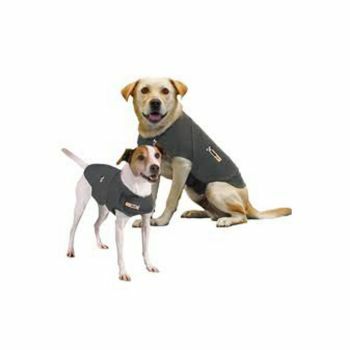 Up to 85 pawcent of dogs experience varying levels of relief while wearing a Thundershirt. The Thundershirts company is so confident in their product that they offer a money-back guarantee if you find that it doesn’t provide some relief. See their Testimonials page for real life success stories. This wrap-around anti-anxiety reliever is easy to put on and remove, and is a great all-natural way to approach this serious behavioral issue. 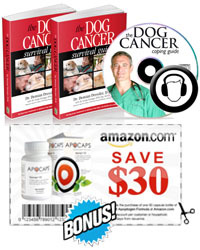 At just $36, it’s a bargain compared to visiting the vet for pharmaceutical alternatives. Check the Thundershirts FAQ page for complete measuring instructions and answers to common questions. Stay tuned for a complete Thundershirt review from front-leg Tripawd Max, and rear-leg high-anxiety Tripawd Spokesdog Wyatt Ray. Meanwhile, if you have used one, be sure to let us know how it worked for your Tripawd in the comments field below. Meanwhile, remember that all Thundershirt purchases made here in the Tripawds Amazon Blog help to defray the costs associated with maintaining this community. Thanks for your support. While I haven’t used one on Maggie(Tripawd) I have used it on my other dog, Haley, who is noise/thunder phobic. I have used the T-touch anxiety wrap before but that didn’t do anything for her. However, the Thundershirt is awesome for her!!! It stops her from shivering and panting and eyes dilated. She still notices the storms but this is a HUGE improvement! BIG thumbs up for this product!! Thanks for the feedback T! We are going to get one for Wyatt before we hit the road, we’re thinking that it will help his wild behavior in the truck when we’re hauling the trailer. SO glad to hear it worked for Haley. I will get one soon and 4th of July will be the big test!!! We usually have to drug her until she is as high as a kite (not preferred) otherwise she has severe panic attacks and claws at things trying to escape. Cool, Chloe, let us know how it works. Doping just stinks, it’s so saaaaaad, almost as bad as the panic attack! Ok, so I decided to order one. Apparently I should have done it sooner since there is an expected thunderstorm on Wed here (which are usually rare here and I didn’t think we would get one so soon) and I have class all day 🙁 . Anyway it would be good to have in the future to see if it helps her during another thunderstorm. Guess I will have to give her natural calming meds since that’s all I have and just hope she doesn’t destroy the house. My roommates said it was ok to leave her inside that day since one comes home for lunch and the other comes home early afternoon. I just hope I don’t find the front door scratched through… At least the neighbors can’t call the AC on us again for “neglect”. Don’t know if you read my forum post on that. Quite ridiculous, but it turned out fine in the end. I digress. I will let you know how the calming vest works for her! I did see Chloe’s AC post!!! Gawd…Ridiculous!!!!! I hope the Thundershirt helps her as much as it helps Haley. Haley was never to the point of scratching stuff though. She rather just tries to hide, shivers and shakes all over. Oh yeah we saw the post, sorry that you have a weird-o neighbor Chloe. Don’t let it get to you though, their loss you know? Let us know how the Thundershirt helps! I’m sure you’ll be GREAT inside the house, you’re such a sweet girl. Yay, Chloe’s came yesterday!!! I did the suggested techniques for getting Chloe to like it (she loves her harness, so it really wasn’t hard for her to be OK in it). I am incorporating this into her SA therapy as a way to help her be calm when we practice being apart. I know that I can’t always have her in it or she might think that she can’t be calm without it. She has been sleeping in it all day 🙂 Will keep you updated on her progress and how the thundershirt helps! Hey Chloe, how’s that ThunderShirt working out for you?